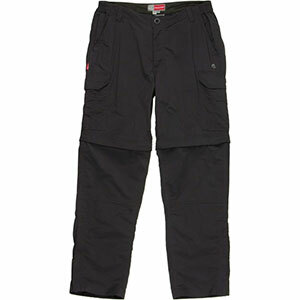 Practical lightweight trousers with nine pockets and zip-off legs, and impregnated with insect repellent. 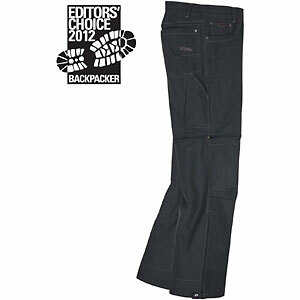 Excellent for warm weather hiking and travel. British brand Craghoppers take a practical approach in the design of their clothing and these trousers are no exception. 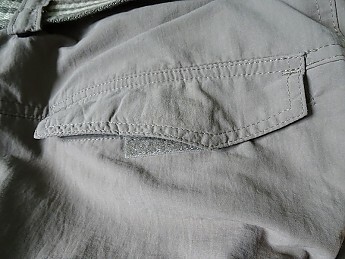 They feature a total of nine pockets—hip, thigh and back pockets plus a zipped security pocket behind the right hip pocket, an extra zipped pocket on the left thigh pocket, and a stretch pocket inside the right thigh pocket that is intended for your mobile phone. In addition, the left thigh pocket contains a plastic dry bag, but I have found this too small to be of practical value and I have removed it. Two of the belt loops are held in place with snap fasteners and can be used as drying loops. 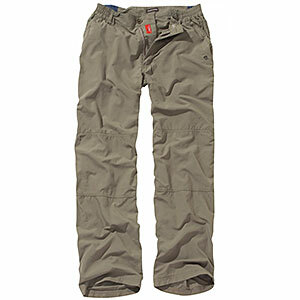 The trousers are made of nylon (polyamide) and dry quickly. 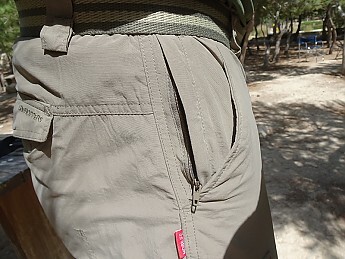 The material is lightweight but it can withstand scrapes and I have no fears about the durability of these trousers. The waistband fastens with two buttons. The main button is held in place not with thread but with a nylon strip so it won't be falling off anytime soon. This is another of Craghoppers' practical touches. 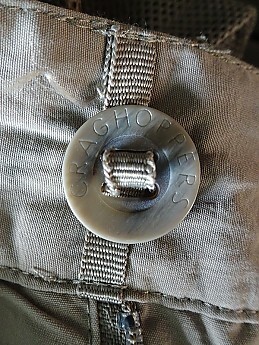 The secondary or inner button is stitched on in the normal way, but in case it falls off a spare is stitched to a label on the inside of the trousers. 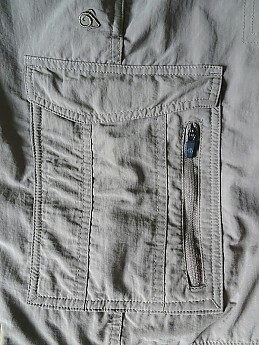 The thigh and back pockets use hook-and-loop (velcro) closure, but the velcro strips on the back pockets are misaligned so these pockets don't close properly. 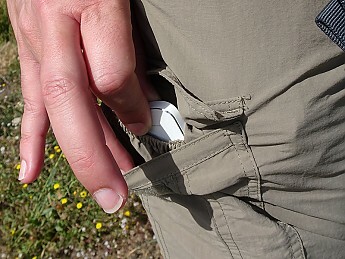 This is not a problem for me because I tend not to use the back pockets on any trousers I wear, but it is something to keep in mind if you like to keep your wallet or anything else valuable in a back pocket. The trouser legs zip off roughly an inch above the knee. There is a vertical zip running part of the way down the lower trouser leg to make it easier to remove the lower leg without taking off your boots. Fit is true to size. 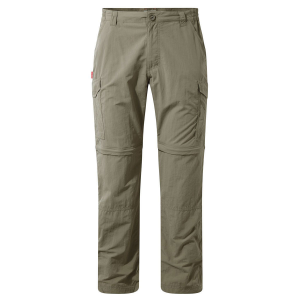 Craghoppers trousers come with a choice of three trouser lengths—short, medium, and long. I am 6' 1" and I usually wear 34" trousers, and I found the size 34 long to be a good fit though the cut is slightly less generous than other trousers that I have. 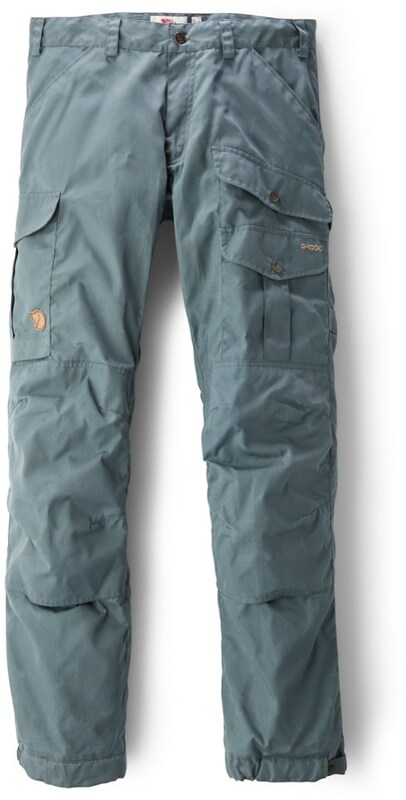 The trousers are impregnated with insect repellent which, Craghoppers claim, will last for the life of the trousers. I've not had the trousers long enough to be able to comment on this. I'm happy with these trousers, apart from the minor issue of the back pockets. 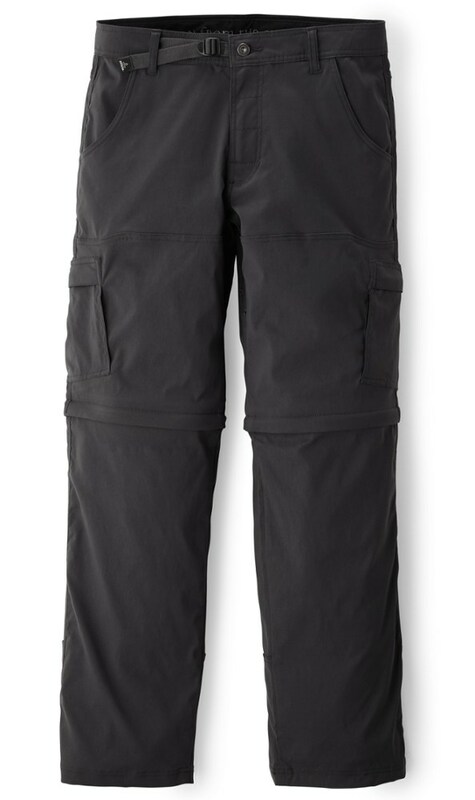 I wish the thigh pockets were a little bigger, but small cargo pockets are probably an inevitable feature of convertible trousers. Enlarging the thigh pockets would mean lengthening the upper trouser leg to the point where the join between the upper and lower leg would fall on the knee, which would probably make for uncomfortable walking. Thanks for the helpful review of these hiking pants, Charles. I have some Craghoppers clothing. People in the US should note that as a European company they use European sizing which runs a bit smaller than US sizing. The difference is not bad, but for example in a shirt I normally run between a med and large so most of the time I can wear either size, but in Craghoppers I definitely need the large. Nice review. Do they say what insect repellent and how it is bound to the pants? Most insect clothing wears off after a couple years or number of washes. Hi Phil, Craghoppers don't give a lot of detail. All they say on their website is: "Our NosiLife treatment is woven into the fabric; protecting against biting insects. Proven up to 90% protection from mosquitoes and other biting insects that can cause life threatening diseases such as the Zika virus and Malaria." I am sure it is permethryn. I think it is the basis of all the clothing based repellents, with the only difference being how it is bonded to the fabric i.e. they can do things in a factory to make it stick to the fabric longer than we can spraying it on at home. I figure it's the good stuff too. Just wondering how they get it to "stick" longer than Insect Shield. Thanks for the info charles. I think it is essentially their proprietary name for Insect Shield.